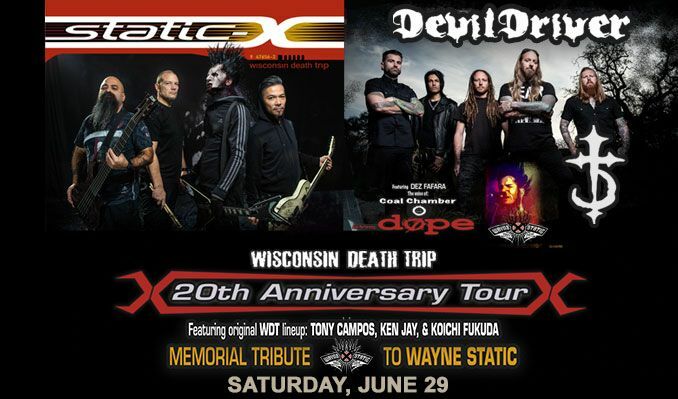 Wisconson Death Trip 20th Anniversary Tour & Memorial Tribute to Wayne Static. STATIC- X to Feature Original Band Line Up: Tony Campos, Ken Jay and Koichi Fukuda. DevilDriver VIP Meet & Greet upgrades available here. Calling Static-X the Terminator of contemporary rock music may seem like an obvious comparison: The band's blunt-force-trauma melding of industrial rock, thrash metal and futuristic disco is nothing if not cybernetic. But when you look back at Static-X's 13-year legacy, the comparison goes well beyond the musical: Since the 1999 release of their platinum-certified Warner Bros. debut, Wisconsin Death Trip, the Los Angeles quartet have weathered musical trends, survived lineup shifts, and even severed longtime creative partnerships to emerge as the streamlined metallic machine they are today; and with their fifth studio album, Cannibal, they sound positively indestructible. Besides looking ahead to spending the next year on the road in support of Cannibal, the terminally creative Static says he's already begun writing the band's next album (one of the benefits of having your own studio); but perhaps more importantly, he's looking forward to hanging onto the pure, uninhibited energy that brought these current songs into focus. "The simple fact is that I love what I do," he says. "I love writing; I love touring, I can't imagine doing anything else." And as he looks forward to the next stage of Static-X, it's hard not to return to that old Terminator analogy or at least to imagine some post-apocalyptic version of the Energizer Bunny: "Look at bands like Slayer, Metallica, Megadeth, Iron Maiden," Static says "Not to put us in that league, but when I think about our band, that's how I see us. Our touring just gets stronger every year, and our fans know we're always going to deliver." He laughs. "Theoretically, I suppose we could keep going forever."